I keep gravitating back to this "Waterfront" stamp set that is in the new 2018 Occasions catalog. I remember last year there was a really fun set that was in the Occasions catalog and because it was SO popular I thought it would end up in the yearly catalog, but no it was not in there. So I have that same feeling about this set. I am going to be making several more cards using this fun set. I think it's my favorite. Though I say that about a lot of the sets I use!!! LOL I am going to play with the Sale-a-Brations sets a bit more because those do retire at the end of March and will never be in the catalog. So for my card today, I found it on Pinterest. I changed it slightly. I added words at the bottom and I didn't have the stitched ovals as large as the ones that were used there. Both ovals were stitched ovals. The one I used was the largest stitched oval and it still wasn't as large as in the original card. The base of my card is a folded half-sheet of Whisper Whit card stock. I scored it from the fold at 1/2" intervals for a total of 4 scores. But only 3 show so if I ever do it again I will only make 2 scores. I cut a 1-1/2" x 5-1/2" piece of Marina Mist card stock and stamped Marina Mist ink on it using the trees image. I taped that to the front of the card. Next I took a piece of Whisper White card stock and stamped the mountain using Smoky Slate. Under the mountain I stamped the long strip stamp using Pear Pizzazz. Then I added the water image using Soft Sky. The trees were added, but I did tape off the trunks. I also used the Early Espresso marker after I stamped the trees in Garden Green ink. Then I stamped the sun using So Saffron ink. The words are from the "Guy Greetings" set and I used Night of Navy to stamp them. I used the largest stitched oval die and cut out the images. 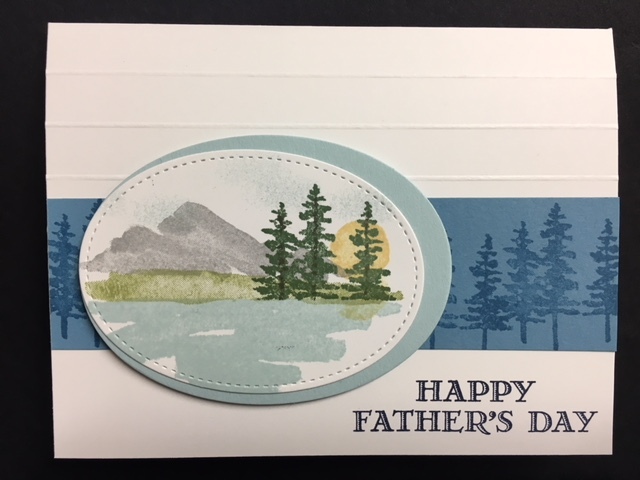 Then I used the largest regular oval die and cut one using Soft Sky card stock. I taped those two layers together as you see in the photo. Then I set those ovals in place using Dimensionals. I did stamp the words after I added the ovals. Something I don't usually do but the words were an afterthought. I do like how the card turned out.